Malipiero is an Italian twentieth-century composer who wrote 17 symphonies, but is virtually unknown outside Italy. 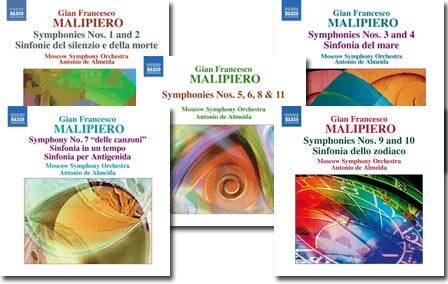 His works are often described as "sinfonias" (the Italian word for symphony) to emphasise that his style is Italian, in contrast to the classic German Romantic style of symphony. You can now discover his works through a series of excellent CDs recently reissued by Naxos. Particularly recommended are Symphony No. 6, his most popular work, and Symphony No. 9, a late work with an unusual structure.